We were very pleased with the service we received during our stay. There were some repairs that were done during our stay as well as a new electronic door lock installed. All workmen were polite and efficient. When we had a problem with the new lock not working, the maintenance staff was very helpful in quickly resolving the issue. All in all, we felt that the staff was the best we've seen in any of the places we've ever stayed. Thanks for making our stay great! Annie Marie's response time is good and answered all of our questions. Anne Marie and her team are wonderful. Lovely unit, beautiful furnishings, every thing you'd need to make your time in paradise fantastic. We will be back! Team members were nice and courteous, helpful in resolving issues. Very nice condo with a nice location and good amenities. Great value regarding cost. We dealt with the team mostly by email and phone. They were always very friendly and professional and responded quickly to inquiries. Mahalo!! Really appreciate the last minute help in sorting out our booking - their help & friendliness was really appreciated. We loved the property and would stay again. However the kitchen needs a cheese grater and a serrated knife. We missed our returning flight home. I immediately called resortica and they were very helpful with booking us an additional night. After confirming that we had a wonderful place to stay my husband and I were both secretly happy about missing our flight! The team worked incredibly fast to make sure we could return for that extra night. This place was amazing. It was so clean and beautifully decorated. Thank you for the lovely place to stay. We are hoping to book through Resorticahawaii for years to come! An amazing property that was immaculately clean and well furnished. 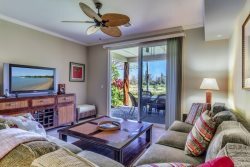 A perfect place to enjoy a vacation on the big island. The concierge -Wendy- was VERY helpful! We loved the house! It was very roomie and had tons of extras. It even had laundry detergent! The location was great to tour the island and go to the beaches. We used the pool daily too. We were a little disappointed in the Hilton pools, but my kids went to the lagoon once or twice. We highly recommend this rental. Thank you Anne Marie for your outstanding service, our guests were very please with the property especially allowing a late check out was appreciated.